Thursday is Thanksgiving here in the States, and we're taking a four-day weekend to travel, spend time with family, and maybe do some Christmas shopping. Maybe. So this week's Mac News Review is coming out on Wednesday - and it's been a slow news week. "I've asked Hector Ruiz, the CEO of chipmaker Advanced Micro Devices about his views on Apple several times, especially in light of Apple's switch to using chips from Intel over the last year and change. He's always been at once supportive of Apple, and happy that the Mac now runs on an x86-based processor. But he's never confirmed any talks between Apple and AMD concerning microprocessor supply deals. "So what then to make of this? DigiTimes of Taiwan, which is often a good source of early warning intelligence about such things, is reporting on the surge in demand for a particular type of component that is going to be used in an Apple-made notebook that would use an AMD chip." PR: The Newer Technology MAXPower Processor upgrade cards are designed to add years to your older Power Macintosh G4's life. If your older system is feeling it's age and needs a boost, a new processor is just what you need to rejuvenate your Macintosh! Quiet and cool running, these upgrades are simple to install, taking less than 10 minutes. Up to 2.0 GHz - a huge speed gain! Achieve furious Mac acceleration in 20 minutes or less with easy to install MAXPower Processor upgrades from Newer Technology! Engineered for high speed with Plug and Play technology, it is possible to effectively double or even triple the speed of an older Power Macintosh by adding a MAXPower G4 upgrade from NewerTech. NewerTech MAXPower G4 upgrades dramatically improve Mac performance and restore the value of your investment. MAXPower Upgrades utilize higher speed Motorola/Freescale PowerPC G4 processors that are coupled with exclusive technology advancements and added cache capacity over standard original CPU. Advanced features are designed to make the NewerTech MAXPower G4 upgrade the most stable and highest performing processor upgrade available on the market. The Motorola/Freescale MPC7447A processor is a high-performance, low-power, 32-bit implementation of the PowerPC RISC architecture. Key architectural features include 512 KB of on-chip L2 cache, a 64-bit bus interface and a full 128-bit implementation of Freescale's AltiVec technology. The MPC7447A processors are ideal for leading-edge computing, embedded network control and signal processing applications. MPC7447A processors benefit from Freescale's silicon-on-insulator (SOI) process technology, engineered to help deliver significant power savings without sacrificing speed. The MPC7447A offers eight instruction BAT and data BAT registers to help support lightweight embedded operating systems, enabling more large tables of data. The processors also provide cache locking to the L1 caches so that key performance algorithms and code can be locked in the L1 cache. Mac OS 9.2.2 or Mac OS X 10.3.5 (or later) is required for 7447 CPUs. Mac OS X 10.3.8 (Including Mac OS X 10.4) or later is recommended for all systems. One note of clarification: If your Power Mac G4 came from Apple as a dual processor machine, it has a single card with two processors on it. This dual CPU card is removed and the MAXPower G4 card replaces the Apple card and both CPUs. It is not possible to install two MAXPower G4 cards to replace the two processors in your machine; only one card is required. PR: Apricorn, specialist in personal storage, has announced further expansion of its EZ Bus Desktop Storage and Backup line with Apricorn's award winning Data Protection Suite for Mac. Providing powerful backup, synchronization and encryption tools, Apricorn's Data Protection Suite contains ShirtPocket SuperDuper!, Qdea Synchronize! X, and Apricorn's Encryption Utility. The EZ Bus Desktop FireWire/USB 2.0 Combo (EZ Bus DTC), featuring a combination FireWire 400 and USB 2.0 interface is the ideal external hard drive for backing up data or adding extra storage to any notebook or desktop Mac. The plug-n-play and hot swappable features make hard drive capacity expansion simple. With up to 500 GB of additional storage in a high performance 7200 RPM drive, users can backup their entire systems and safely store large files including digital photographs, emails, music and video files. 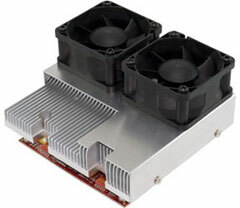 To ensure optimal operating temperature and to protect stored data, the EZ Bus DTC was designed with an ultra-cool fan and aluminum enclosure to dissipate heat. "We're proud to further expand our product offerings to the Mac market, first with the Aegis external hard drive line and now with EZ Bus Desktop Combo," said Mike McCandless, Apricorn's Vice President of Sales and Marketing. "The design of the EZ Bus Desktop Combo makes it portable and convenient, and the large storage capacity and powerful software bundle provides a back up solution for an entire system." Apricorn's EZ Bus DTC hard drive models are available in 80 GB to 500 GB sizes and come with a vertical stand. 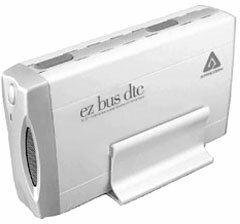 Additional features for the EZ Bus DTC include a 7200 RPM drive with FireWire/USB 2.0 interface, 6 to 6 pin FireWire/1394 cable, 4 to 6 pin FireWire/1394 cable, USB cable and AC adapter. The hard drives are also bundled with extensive backup, synchronizing and encryption software: ShirtPocket SuperDuper!, Qdea Synchronize! X and Apricorn Encryption Utility for Mac. Apricorn's EZ Bus Desktop Storage and Backup Solution for Mac user's is currently available in the US, Canada, and online. PR: XRackPro2 is a server rack rackmount enclosure cabinet specifically designed for noise reduction, security and mobility. Rackmount computer servers and RAID storage become whisper quiet in these rolling rack systems. 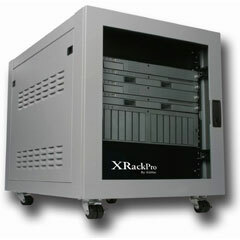 The XRackPro2 is an ideal server rack and computer rackmount cabinet for Apple (Xserve server and Xserve RAID), Windows (Dell, HP, IBM, etc. ), Linux, Sun, SGI, and other PC computer rackmount servers. Noise from equipment mounted inside the XRackPro2 server rack rackmount enclosure cabinet will be reduced by as much as 75% from the sound dampening rackmount cabinet design while keeping everything cool at the same time. With the benefits of noise reduction, security and mobility that the XRack Pro2 server racks provide, rack mount servers, RAID systems and other components can now be used in environments where they could not before. XtroVERT is a vertical mounting enclosure that brings the Xserve RAID out of the rack and to the desk. Whether you have a need to use the Apple Xserve RAID close to the host computers or that you do not have rack space available, the XtroVERT is the solution. The XtroVERT's classic, sleek shape is engineered to match the Xserve RAID perfectly and provides a fully integrated, single-unit look. Engineered with Xserve RAID's demanding performance in mind, the XtroVERT includes an integrated mounting system that allows proper tensioning of the Xserve RAID's superstructure. With the freedom the XtroVERT provides, there are many more options to where the Apple Xserve RAID can be placed. PR: GizMac Accessories, designer and manufacturer of server rack mount cabinet enclosures for noise reduction, begins shipping their XRackPro2 server rack mount cabinets in black. GizMac Accessories produces 4U, 12U, and 25U server rack models which reduce the noise from installed equipment up to 80%. Until now, platinum has been the only color available for the XRackPro2, this color closely matches many Apple, Dell, Sun, or other servers and RAID systems with silver or gray type finishes. "We surveyed our customers and found that many XRackPro owners have black furniture or black equipment," says Tim Cave, LOAHS for GizMac Accessories, "GizMac realized a need to make a black version of our XRackPro noise reducing server rack line and we are introducing it today." The XRackPro2 server rack mount cabinet allows computer, audio / video and other equipment to be placed in areas that require low noise. Post production for film, video and audio editing; television, cable and radio broadcasting; business offices or any other environment that requires low noise and want a darker cabinet will benefit from the new black XRackPro2 series. 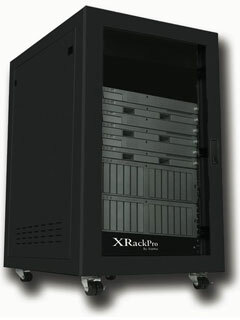 Pricing for the black XRackPro2 server racks start at $499.99 US retail. Purchases can be made through authorized resellers and on the XRack Pro website or by calling the corporate headquarters at (800) 475-1677. Uses your home stereo's remote! 1G and 2G iPod nano, even the red one! This product has been designed specifically to work with iPod and has been certified by the developer to meet Apple performance standards. Rainbow Mode: All the colors of the rainbow, soothingly flowing from the base to the top. Even freeze the lights at your favorite blend! EQ Mode: An exciting, pulsing level meter tuned to the volume of your iPod's music. Cycle Mode: A slow progression through every color in the spectrum. Adjust the speed of cycling for a calming or exciting effect. 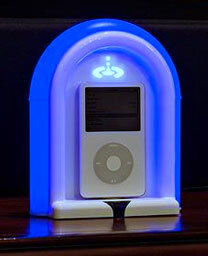 Steady Mode: Tune JukeDock to one, steady color to match your decor or mood. With most of the entire spectrum of colors to choose from, JukeDock is the most customizable dock ever made! In addition, you can adjust the brightness of each mode, and change lighting modes or turn them off with your remote control. Check back soon for movies of the lights in action. Audio: A home stereo or powered speakers with RCA inputs. Sync: To sync with your computer you must have an unused USB port on a computer that support iTunes. Yep, JukeDock includes a 6' USB 2.0 cable too! PR: Consumer Rated purchased popular Apple iPod downloads such as movie, games, music, and software downloads from 50 different Internet companies. All reviewed and you will be surprised what they found. 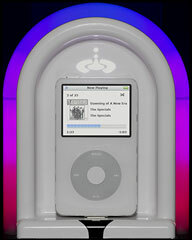 The iPod has become one of the most popular electronic devices in recent history. With its technological advancement of the way we listen to music, watch videos or play games, it is a wonder how we can do with out it. Every new iPod release adds more to the addiction of having that little box attached to your body with a set of ear phones sticking out of your ear. With all the new iPod releases, such as the iPod nano and iPod video, many Internet software companies have shown up to the Internet to provide iPod downloads such as iPod music downloads, iPod movie downloads, iPod game downloads and iPod software downloads. Now you can download Movies, Music and Games and much more with the touch of a button directly to your iPod. The question is what iPod downloads are the best? Is the iPod software compatible to my iPod set up? and Is it really worth the money for what you get? With these questions in mind one company put over 50 iPod download companies to the test. The company is Consumer Rated, and what they found was many of these companies offering iPod Games, iPod Music, iPod Video Converters, iPod Wallpapers and various iPod software were really just selling unusable software that did not even work on their iPod. In one case the iPod download disrupted the normal functions that eventually caused the premature death of their iPod. Consumer Rated did however find a few that were quite unique, and lived up to what the download company promised. After months of testing Consumer Rated found a few that they actually were able to give their top rating (5 Stars). The criteria they used were iPod download compatibility, easy to use iPod software that did not disrupt the normal functions of the iPod, the value to what was offered and most important whether the company gave a 100% satisfaction guarantee. So if you are one of the millions of people that own an iPod and would like to get much more use out of it, you should take a look at the reviews that Consumer-Rated.com provides on some of the best downloads you will find for your iPod.